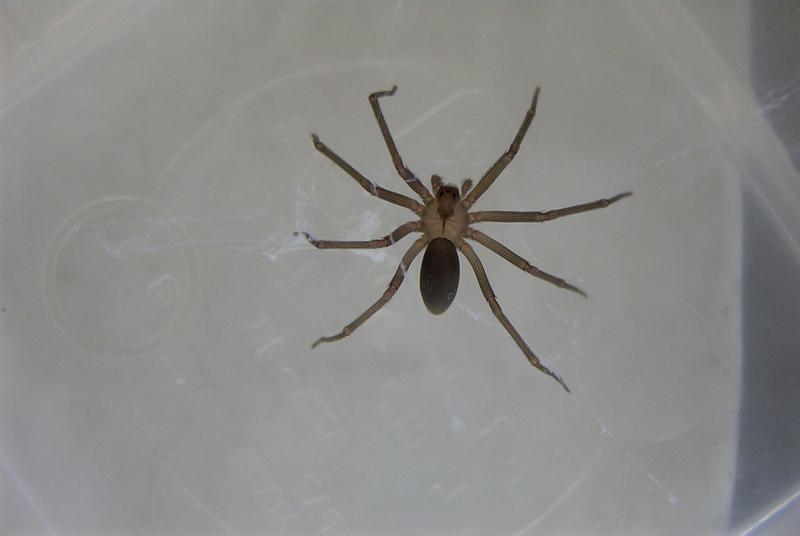 The brown recluse spider is very soft bodied and secretive species found in homes and out buildings. When brown recluse spider is an adult it is between 1/3 and 1/2 inch in length. Their bodies are yellow to dark brown and has a darker brown violin-shaped mark on the back. The brown recluse spider can inflict a very dangerous bite. Initialy the pain is not very intense. Within about 8 or 10 hours the pain becomes very intense and over a few days leaves a large sore. The sore is very slow to heal and could leave a very ugly scar. Brown recluse spiders can be found in the southern, western and midwestern parts of the United States. The brown recluse is usually found indoors in bathrooms, bedrooms, closets, basements, garages, cellars and in other secluded areas. Out buildings are also a place to find the brown recluse. Control of any and all spiders indoors may require only a vacuum cleaner. Paying close attention to dark corners and clutter. Sanitation is a must. A small can of insecticide labeled for spiders might be handy around the home for contact kill. Most spiders are very recluse and will stay away from open areas. Residual control for spiders on a long term basis is almost unachievable. Insecticidal dusts work well in crawl spaces and attics. Wettable powders and microencapsulated formulations will give a longer residual outdoors. If spiders are entering from outdoors, spraying around all windows, foundation, doorways and eaves will help tremendously. Caulk around all doors and windows in and out.